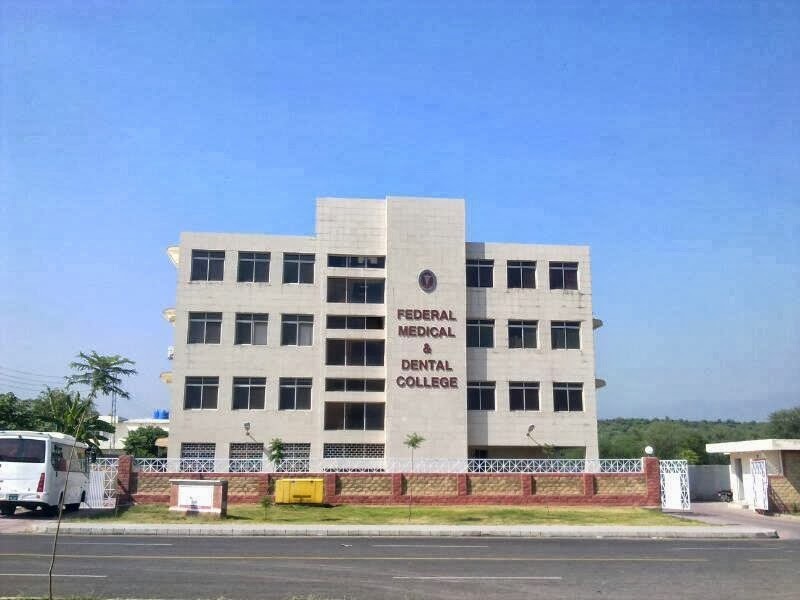 FMDC is the first public sector (Government) Medical college established in the capital city of Pakistan.Affiliated with the Quaid-i-Azam University and with the Pakistan Institute of Medical Sciences (PIMS) providing attached hospital facilities. Q:1: What are the various Departments at FMDC? Q:2: What are the programs/degrees offered at FMDC? Q:3: What is the tuition and hostel fee at FMDC? Q:4: What is the distribution of seats in FMDC? Q:5: How to apply for FMDC? Q:6: What is the pattern of the Test? Q:7: Is there any negative marking in the test? Q:8: How much time is alloted for the test? Q:9: Where is the test conducted? Q:10: What is the merit criteria in FMDC? Q:11: How to prepare for the entrance test? Q:12: What were the closing merits of last year? Q:13: From where I can get the sample or the past paper? 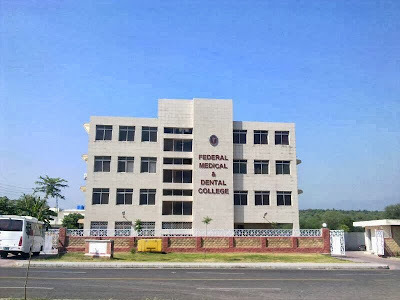 Currently FMDC offers only MBBS, BDS is expected to start soon. The admission forms are available on the nts website NTS website . You have to download the form, fill it and send via post on the address mentioned on the form. You will get a roll number slip in the last week before the test. Last date for application submission is 23rd October 2013. Test will be conducted on 10th November 2013. Domicile will be required at the time of admission so if you are willing to apply you must possess a domicile. For physics, chemistry and biology you have to prepare the complete books. While the syllabus of English is not well defined. There will be 10 mcqs from English portion two from each Antonyms , Synonyms , English Correction , Reading Comprehension. There is no syllabus for English. the questions can be from any book, any source. The test is conducted in almost all big cities of Pakistan. Below is the list of all those cities. In case the number of students in any particular city who applied for the test is less than 100 they are asked to take the test in the nearest city. The merit criteria for FMDC is the same as the of UHS i.e 50% test, 40% fsc and 10% matric. They do not include the marks of Hifz-e-Quran in the merit. The best source to prepare for the test are your text books. Some helping books are also available in the market but that too contain the material from your course so its better to read from you course books. Books of Dogar are considered good for the preparation of NAT. As per English you do not need any such preparation. If you are good at English you can do this portion easily. However you can practice the comprehension questions from the web. Here is the sample paper. You can get the idea about the type of paper from it. You can zoom it and view online or download for the offline use. is fmdc good enuff???????????? plz reply! toughh :/ u can chk the past paper ... abv the cumentss !! thankyou fr replying every time! ppl dun reply usually... JAZAK ALLAH! can anyone plz share the fata closing merit list..i vl be thankful to u guys. It's test contain 100 marks that means here our fsc marks are more important as compared to Mcat which itself is of great importance ? Is that so ? i hv done sindh board. is punjab board different from it? i clear bsc part1 and i passed enter in 2010 can i apply for fmdc ? same as that of uhs . 10% matric + 40% fsc + 50% entry test . what is the formula for calculation of %age?? how many people are appearing for fmdc test this time approximately? list of selected candidates for FMDC test ??? Confirm Ur Registration & Test Centre. Print it out aswell, because incase you do not receive ur Roll slip, you can also use this print-out as your roll number and can appear in the test. Roll slips are already Dispatched you will receive it within Few days. or forms kaise lena haI? last date to guzar chuki ha ..
best of luck for the test. Hope for the best..
7 reserve seats merit list kab aygi. abhi we have no idea, will inform u after confirmation. When are the registerations for 2014 coming up on the site? fmdc test for 2014 kb hy?? ?can u tell me the date plz??? For FMDC nta is essential! Is it the percentile that is considered or the percentage? Has the addmission at FMDC stopped? test kab conduct hoga?Is se pehle Nts ka test zarori hai?? The syllabus for NTS fmdc test is the same as that for MCAT or it is all FSC based? the test date will be announced later, last year the date was advertised at the end of sep.
Could you please tell me about the syllabus for fmdc? what is the last date to submt form or of registring for fmdc nts 2014??? and when vill the test cnducted??? dates not announced yet . SIR MA NE NTS KA TEST DY CHUKI HU...TU FMDC K LIE DOBARA APPLY KRNE K LIE DOBARA TEST DYNA PARY GA YA PHLY WALY HE MARKS K SATH ADMISSION HOGA????? please update the date for fmdc test when it is announced. what is the Eligibility criteria. my got 655 in fsc is she eligible? i got 875 in fsc any chances of getting in ? sir, iuse school of engineering and managment sciences kesi uni ha software myn admission hoa ha wahan mera mujy jana chahye ya nae? Is fmdc affiliated with uhs? how to download the application form of fmdc entry test 4m nts site? and 4m when are registrations going to start? fmdc ka test nov me ho ga na? i got 942 marks in fsc hw mch marks i should take in fmdc to qualify fo it? how mch marks should i get in the FMDC test?? mere fsc me 916 marks hain mujhe nts me kitne marks ki zarurat h? sir can you please tell me that from where i can get registeration form or there is any site for registeration ? please tell me m so worried.. Sample papers mil sakte hai kahin se? sir plzz mujhay bata den ke fmdc ke registration kab khulni hain test ke liye or agar khul gai hain to form kahan se milay ga? its attached above in the post ..
i got 684 marks in Fsc & 666 in matric... And I'm from Gilgit-Baltistan.. how much marks i need to get in FMDC? where is the closing merit of last year for Gilgit-baltistan? fmdc ki reg.kis date sy start honi ha? sr plz test date beta dain exact or Regis.KB c o ri hain. And past prz khan c mile gain?? Plz reply me soon. plz tell me the date of FMDC entry test and what is the last date to submit applications??? paper of 2012 is attached in the link given in the post. i have got 920 marks in matric and 900 in fsc ?how many marks are required for admission? total marks aur her book se kitne mcqs hon ge . plz marks detail b bta do. Sir I got 997 in metric and 972 in Fsc..and in NTS 69. my admission is possible in FMDC? i have 952 in fsc and 918 in matric. how many marks i will have to score 4 admission in FMDC? plz tell me! u are from which area? 100 marks. almost all from books. i got 950 marks in fsc.i will apply from federal govt employees.how many marks i need in nts ov FMDC? Please tell me the date of Etest for fmdc 2014???? mre matric ma 985 r fsc ma 968 hn....fmdc ma admission k liye kitne marks chahye mje/=? sir . will u conduct the hifz e quran test or not? how many seats of punjab r there? total mcqs 50 hon ge ya 100? english k liye kon si book use krni chahiye ? m from punjab. i have 948 in fsc. is it possible 2 get in fmdc if i will get about 86 marks in nts? can i apply from both punjab nd federal govt employees at the same time? I got 692 marks in matric and 910 marks in xii (HSC II), i want to know about FMDC test syllabus, should i stick to Sindh text book or read fsc for entry test? I am applying for MBBS from sindh rural,how many mcq should i correct to get admission in FMDC? It's depends on your Domicile. then please tell me what is the final date to apply for test. my domicile is of punjab. You are eligible for Punjab quota and you can also apply on Federal Govt. employee quota with the proof of Docs. Currently, I am looking for Registration Form for PMDC test on http://www.nts.org.pk. Not find anywhere. Can you send me the exact link of the application form along with online deposit slip. Thanks! I hv 889 in metric n 909 in fsc. I m frm kpk ... hw much mrks i need to scre in test ... shld i prepare frm kpk books or fedrl books ? i have got 800 in fsc how much marks i need to score in test im from balochistan...and registrations kb start ho gi ????? Focus on your syllabus books. Your FSc marks is low. Need max. marks in test. i have got 918 marks in matric and 907 marks in FSC i am from KPK how much marks i need to score to get admission over there in fedral medical college ??? You have to need around 85 test score to secure the seat. Good luck bro! sir , 6 seats to merit ki hain, baki 94 seats ka set up ha? punjab ki 40 seats open merit per hain? I got 985 marks in matric and 967 marks in fsc and I am from punjab how much marks are needed to get admission in FMDC? by attaining 80+ in FMDC test i will get my aggregate upto 88% while closing merit 2013 for punjab and merit was 81%.So can i have my admission too by getting marks above 60?Because this makes me to end with 82% finally,Reply if you have any information about this. No you can't because u must have about 60% marks in fsc and if u are serious to get admission in FMDC u must have 80% or above in FSc. me punjab se hn mere matric me 954 or fsc me 916 hn mujhe admission k liye nts me kitne marks ki zarurat h? sir plz bta de k registration kb start ho gi or test ki most probably date kya h? Sir bt are'nt fedrl books much conceptual den kpk books n wil it not create any diffrnce... n i thnk test come frm fedrl books... so ? i got 949 marks in fsc and 966 in matric. how much marks i need in nts for fmdc? i m from islamabad. sir plz bta den k form kab ae ga??? mere fsc mai 950 hain. nts mai kitne mrks ane chahiyen?? Registeration kb sy start ho rhi hai?